Apple at its 'Let Us Loop You In' event on Monday unveiled the new iPhone SE apart from a smaller iPad Pro. The company also announced several updates on its product portfolio including a major price cut on the Apple Watch. The latest 4-inch iPhone shares innards similar to the iPhone 6s but sport a design that's reminiscent of the iPhone 5s - the company's last 4-inch iPhone launched in 2013. The Cupertino-based company usually doesn't share battery capacity of its iOS devices, and this time is no exception. However, the newly launched smaller iPhone SE has been rated by the company to deliver better battery backup than the bigger iPhone 6s is a surprise. The smaller display size and lower resolution may of course be the biggest factors. Things get more interesting when one realises that the iPhone SE has been priced at Rs. 39,000 for the 16GB model in India, while the iPhone 6s is retailing at Rs. 45,000 for the 16GB model. According to Apple, the iPhone SE can deliver better battery life with Internet usage on 3G, LTE, and Wi-Fi than the iPhone 6s. The official listing says that the iPhone SE can offer up to 12 hours of Internet usage on 3G; up to 13 hours of Internet usage on LTE, and up to 13 hours on Wi-Fi. To put that in perspective, the iPhone 6s is rated to deliver Internet usage of up to 10 hours on both 3G and LTE, and up to 11 hours on Wi-Fi. In terms of video playback, the iPhone SE can deliver up to 13 hours while the iPhone 6s can offer up to 11 hours of HD video playback. Notably, the iPhone SE and iPhone 6s are claimed to offer similar talk times as well as standby time. Both the phones are rated to deliver up to 14 hours of talk time on 3G and up to 10 days of standby time. 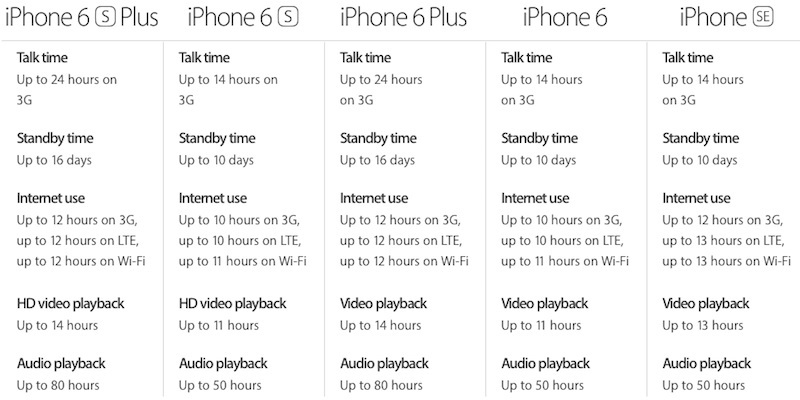 Both the iPhones are also listed to deliver identical audio playback time of up to 50 hours. Looking nearly identical to the iPhone 5s, the iPhone SE comes with the colour variants introduced with the iPhone 6s - including Rose Gold. In the US, Apple has priced the iPhone SE 16GB at $399, while the 64GB variant is priced at $499. The new iPhone will go on sale on March 31, and will be in 100 countries by May. The India price of the iPhone SE starts at Rs. 39,000.